Stretching: Possibly the secret weapon for any successful athlete, especially runners. The trick is knowing when to stretch and how to stretch. It’s also important to know some stretches are better for runners than others, and even if you have just a little bit of time you can make a big difference in your performance with a few specific moves. Dynamic stretching looks different than traditional floor moves, as they’re typically active movements that can be safely done before a workout or run without expending too much energy. “Dynamic stretching doesn’t use a lot of energy; you are putting your muscles through a range of motion while gradually increasing heart rate,” said Rosov. And lastly, we all know stretching helps prevent injury that can be caused by muscle imbalances. There’s nothing worse than an injury resulting from something that could have been prevented. So even when you think you don’t have time, remember to stretch. 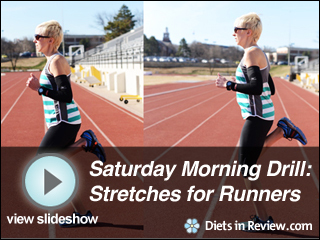 In this week’s Saturday Morning Drill, Rosov provides her eight favorite stretches for runners – the first five are dynamic and the last three are static. Give them a try, remembering to reserve dynamic stretches for before your workout and static stretches for after your workout.